Author V.G. 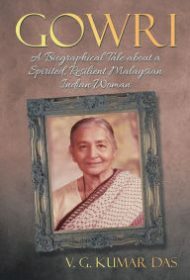 Kumar Das offers readers a thorough and loving portrait of his mother, Gowri, a woman who ensured the survival and success of her family through her courage and tenacity. In this eloquently written homage to his mother, Das recounts how Gowri emigrated from South India to Malaysia in the late1930s immediately after marriage. Her story is contextualized within the Japanese occupation of Malaysia during WWII and a half century of Indian and Malaysian politics and cultural shifts. When her husband passes away from health complications, Gowri is widowed at a young age with seven children. Following an unhappy short stay with her younger married sister, who was in the country, she sets up her own home. Through her many travails, she transforms from a woman who didn’t dare address her husband directly and had never eaten in a restaurant before marriage to someone who stands up to her sister’s emotional abuses and travels the world. A family tree included in the biography’s appendix helps readers navigate the complexity of characters. A more extensive genealogy is also offered of the earlier generations of Gowri’s matrilineal bloodline, who have a contentious history examined predominantly in the second chapter. The book includes more detail than average readers may find interesting, including many minor family incidents. As a result, it’s perhaps best suited for those in the family’s inner circle. Still, the culture of Kerala and of one unique family is well preserved within this text.